Designed specifically to minimize Radar Cross Section ( RCS ), the Visby is made entirely from carbon fiber and has the stealth technology specific angular shape. The material dramatically reduces the structural weight (typically 50% of a conventional steel hull). This results in a higher payload carrying capability, higher speed or longer range.Optical and infrared signature, above water acoustic and hydroacoustic signature, underwater electrical potential and magnetic signature, pressure signature, radar cross section and actively emitted signals have been reduced to a minimum. In fact the Visby has a detection range of about 15 km, depending on the sea. In rough sea detection range falls to about 13 kilometers, and in calm sea it can reach 22. If, in addition, jamming equipment is used, detection range falls to about 8 kilometers in rough sea. In naval terms, that is excellent. 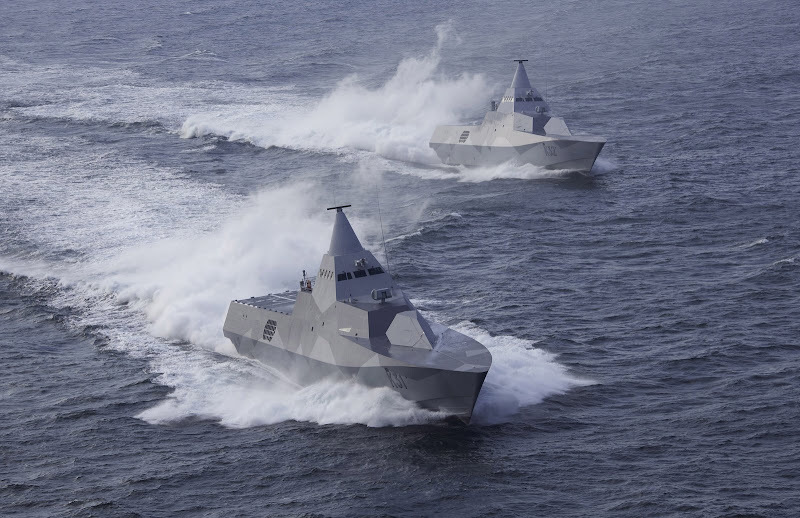 The Visby class stealth corvettes will fulfill the Mine Countermeasures and Anti-Submarine Warfare roles, as well as attack and anti-surface roles. All missions are supported by CETRIS – the real-time command, control, communication, intelligence and interoperability system (C4I2). The system is modular and open, and allows for integration of future technologies, without expensive changes. The combined Diesel and Gas ( CODAG ) turbines allow for a maximum speed of 35 knots. Other features include the capability for a helicopter to land and refuel on the upper deck. Every feature that need not necessarily be located outside the hull has been built in or concealed under specially designed hatches. The gas turbine exhausts have been concealed in hidden outlets close to the water surface at the stern of the vessel. Construction of this amazing vessel started in 1996 at Kockums’ Kalrskrona yard. Five Visby class stealth corvettes have been launched so far. The first, Visby, was launched in June 2000, followed by Helsingborg in June 2003. December 2004 marked the launch of Harnosand, Nykoping followed in August 2005 and Karlstad was last exactly one year later, in August 2006. A sixth vessel was canceled. The Swedish Defence Material Administration received the first two ships in 2006 ( K31 Visby and K32 Helsingborg – seen in the picture above), and the rest are to be delivered by the end of this year. The aegis class looks to me as a conventional war ship witch means that the visby class can fire one RBS 15 from about 100KM rage and diapers before the aegis class even know they are there. And for the record, dont think a visby class will go to war against an aegis class, USN are interested in the ships and one of the royal swedish navy subs have sunk the USN Pacific fleet a few times over so I wouldnt look down so much on the swedish armed forces materials if i were you. sweden might be a small country but they have given the US armed forces hell in both the air and the see in war drills. The writer did not do his homework. The Visby is not the first operational stealth ship, that would be the Norwegian Skjold class. Now that they have a radar evasive destroyer, when will they develop the first radar and sonar evasive torpedeo, capable of traveling distances of 2,500 Nautical miles to its target using a new type of underwater propellsion? Can Kockums accomplish this or will they need to contact the US Navy for technical assistance? Now that they have a radar evasive destroyer, when will they develop the first radar and sonar evasive torpedeo, capable of traveling distances of 2,500 Nautical miles to its target using a new type of underwater propulsion? Can Kockums accomplish this or will they need to contact the US Navy for technical assistance? Sweet ships, Think this means a revolution of new military vehicles? The question as long lives the bottom made of a carbon plastic in sea water, especially at a storm. And it is absolutely clear that will happen to the bottom at influence of a shock wave or hit of a bullet of small caliber. As interestingly what stability of the ship with the light weight bottom – probably added 50 tons of concrete? In advance I am sorry for a question – how many it is necessary to have the budget of Sweden to provide all the fleet such expensive crystal court shoes?